Sometimes a single day of beautification efforts can have a significant visual impact. 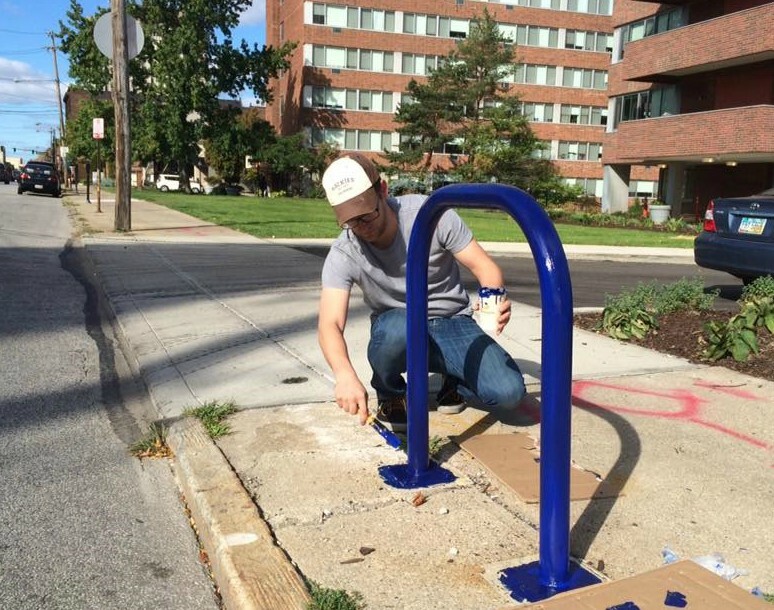 Volunteers recently assisted with painting 16 bike racks along Detroit Avenue. Such was the case during a recent Saturday when a volunteer crew from Lakewood Anglican Church joined forces with LakewoodAlive to enhance aesthetic appeal along one of the city’s major corridors. The group scrapped away rust then painted 16 bike racks on Detroit Avenue from Bunts Road to Summit Avenue, with local volunteer Jim Ryan finishing the job by taking care of the racks near Jammy Buggars. Travel along Detroit Avenue now and you’ll notice bike racks painted a vibrant shade of blue – courtesy of paint provided to LakewoodAlive’s volunteer group by the City of Lakewood. It’s yet another step in the ongoing beautification process of Downtown Lakewood and surrounding areas. The City of Lakewood’s Bicycle Master Plan was adopted by City Council in 2012, resulting in the installation of 50 bike racks citywide, among other bicycle-related improvements. One year later, Lakewood was recognized as a bronze-level Bicycle Friendly Community by the League of American Bicyclists for its commitment to bicycling programs, infrastructure and policies – a designation that remains valid for four years. More recently, the City of Lakewood completed installation of bike lanes along Madison Avenue, incorporating “door zone markings” to reduce conflicts between people exiting parking cars as bicyclists are using the bike lane and “intersection crossings” to raise awareness for both bicyclists and motorists to potential conflict areas. These innovative additions represent a first for Northeast Ohio. For information on how you can get involved with assisting with painting other bike racks throughout the city, please contact Andrews at 216-521-0655 or iandrews@lakewoodalive.org.